We left the school at 9 in the morning, with another group who is also going to Alaverdi. We spent 2 hours on road, which was lot shorter than I expected since I spent 5 hours to come to Dilijan from Tbilisi. 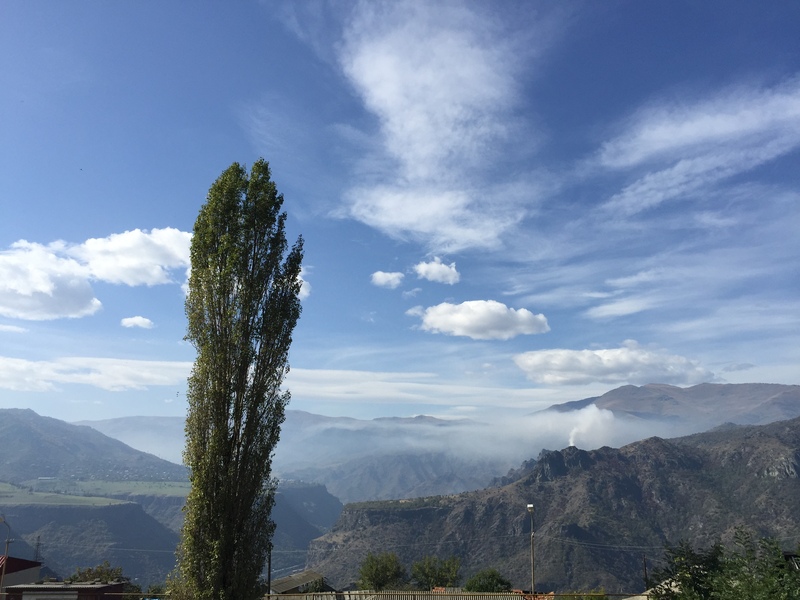 I was experienced enough to know that roads in Armenia are bumpy and drivers are trying to pass each other all the time whatever it takes, so I enjoyed the music along our trip in the middle of beautiful landscape. 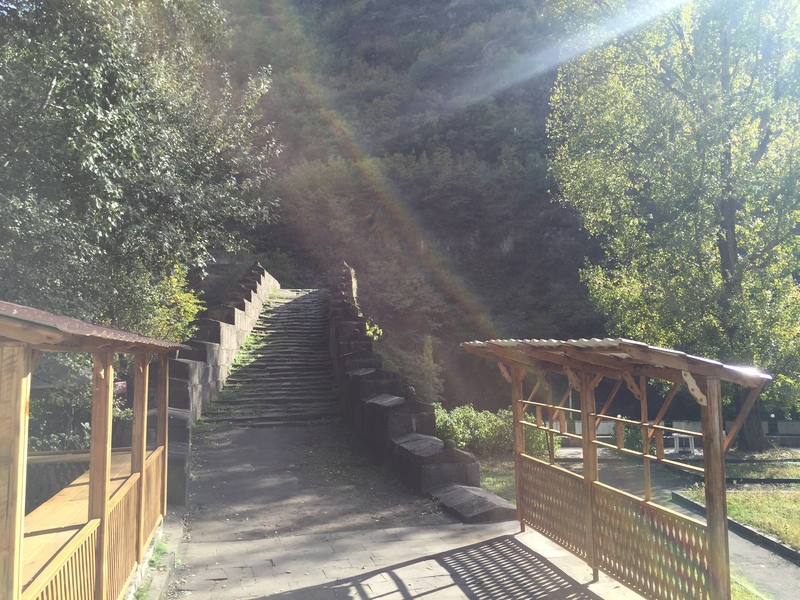 If you have chance to go to Yerevan from Dilijan, you will notice that there’s a stunning difference between two ends of Tavush Tunnel, which connects Dilijan to the road to Yerevan. Since I’ve been in Yerevan for few times, I was expecting same kind of contrast between Dilijan and Alaverdi, but I was quite wrong. 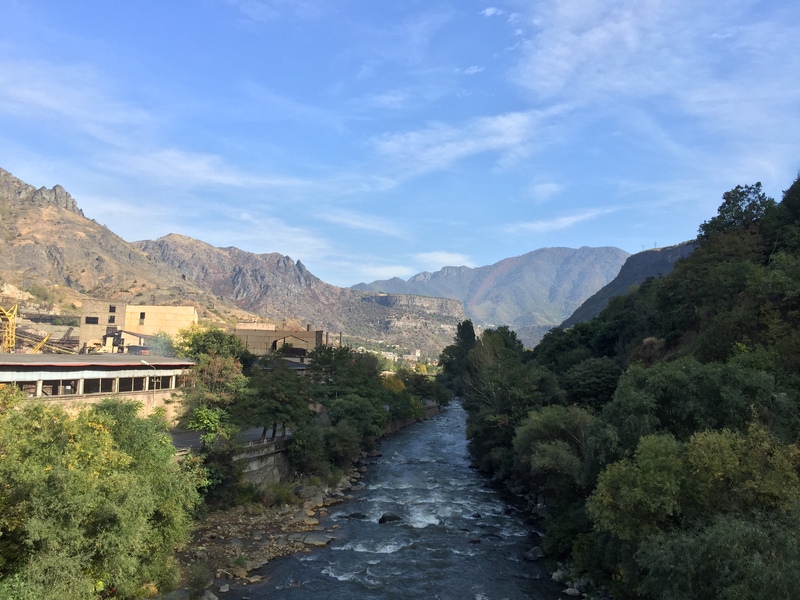 Alaverdi has an amazing nature; it’s been located in a canyon where the Debed River runs along. There are also occupants on the top of the canyon, and these two places are connected with the cable car. 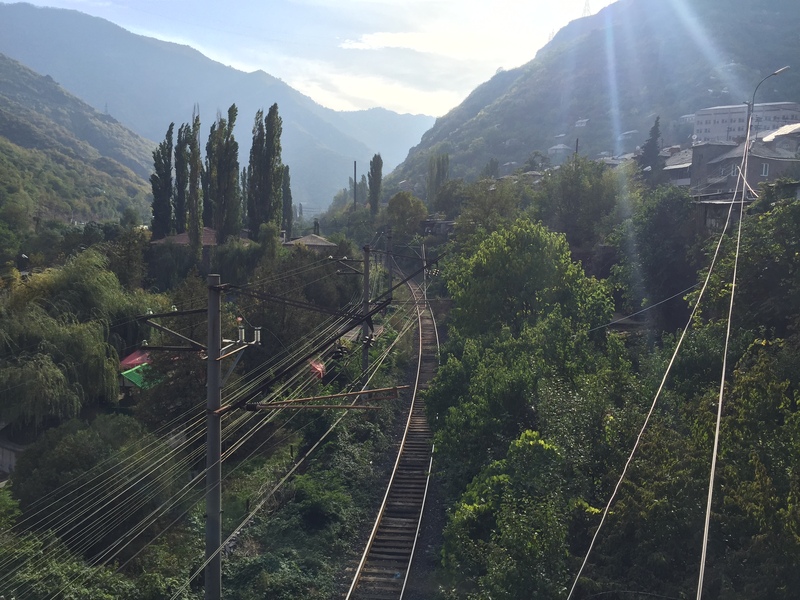 Alaverdi, from the cable car station at the top. On the right side, you can see the copper mine which is still active. 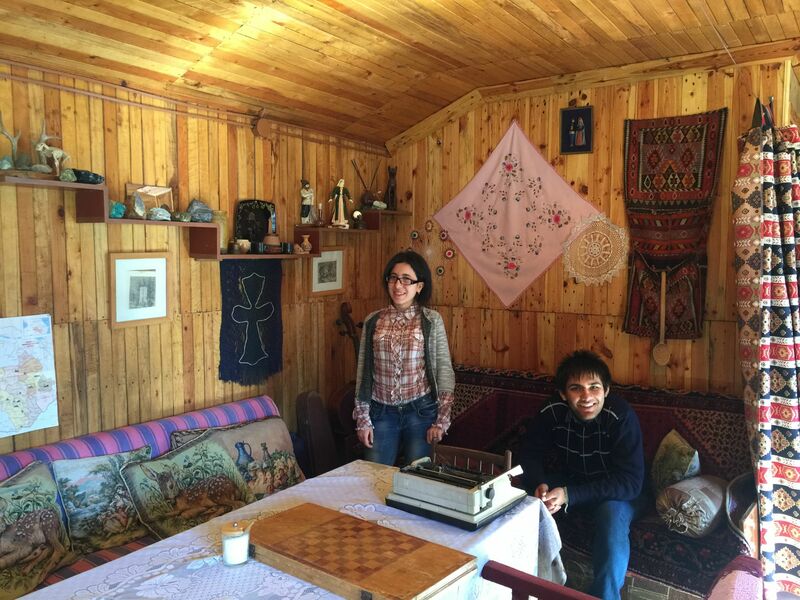 After entering Alaverdi, we went to our B&B (IRIS), to decide who is going to stay in which room and the time of dinner. Lilit, the representative of English Club that we are working with, was waiting us in front of B&B. 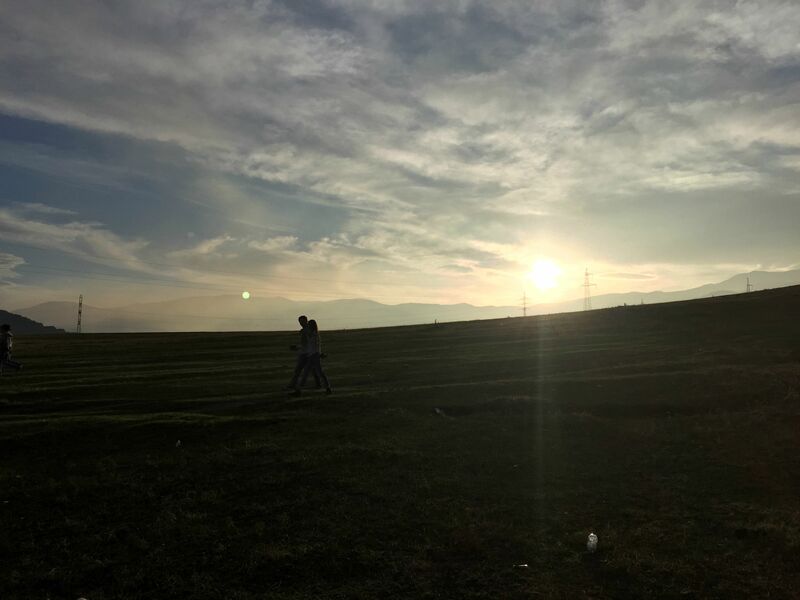 We introduced ourselves briefly, and started walking to the Club which is located at the center of low-Alaverdi (a term that I just made up). Not for once but she guided us throughout our journey and helped us to reach locals so we appreciate that. After arriving to the Club, she told us what they are doing there and showed us the inside of it, the mini-library and the only classroom they have. 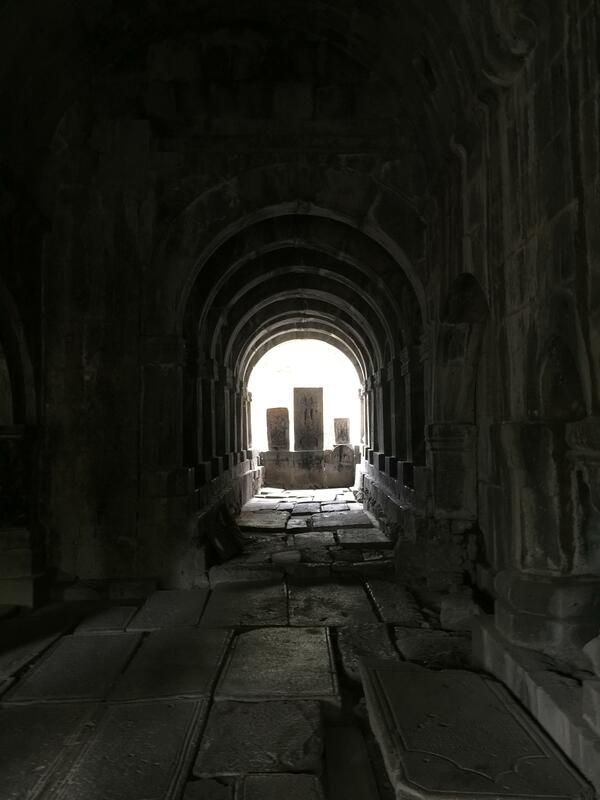 Since the students are still in the school, we decided to visit Haghpat Monastery. On the road to the monastery. 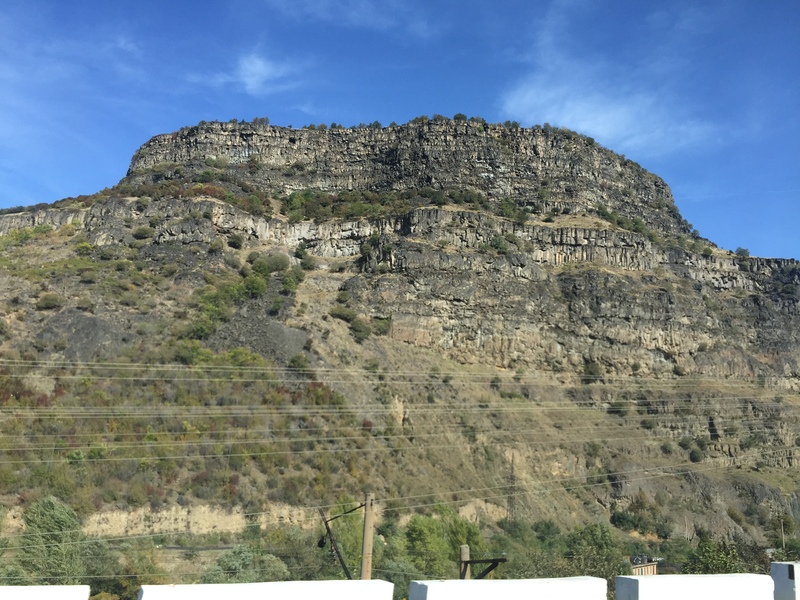 You can see sharp shoulders, which are very common in Alaverdi, which is in the middle of a canyon of Debed River. View from the monastery. The details of the landscape are much clearer. At the end of the visit, we sat down to have lunch which we brought from the school. Enjoying the landscape and talking about what we have seen so far were part of the lunch. After finishing our lunch, we set off to the Sanahin Brdige, the point where we were going to meet with children from the English Club. Debed River as seen from the top of the bridge. 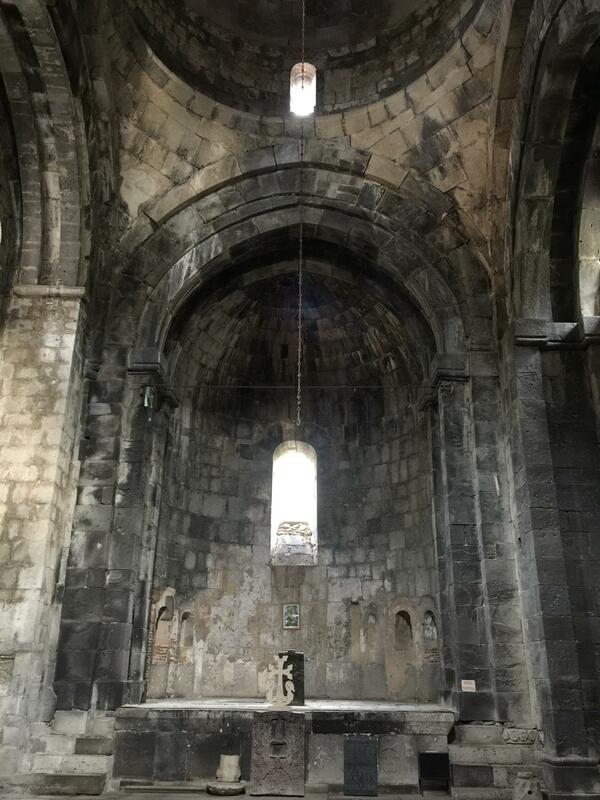 Historically, the area of Manes-Alaverdi was part of Dzoropor canton of Gugark province of Greater Armenia. 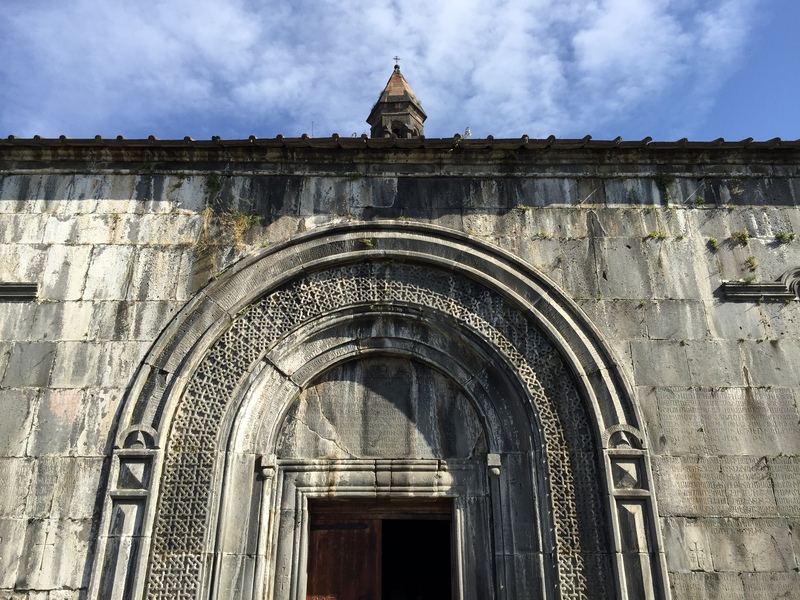 Starting from the 17th century, the settlement became to be known as Alaverdi, derived from the name of a 17th-century Turkic Borçalu tribe leader Allahverdi molla oğlu Tarkhan. When the area was annexed to the Russian Empire at the end of the 18th century, a number of Pontic Greek miners were resettled in the area to start exploiting the copper, through the efforts of the Argoutinski-Dolgoruki family. 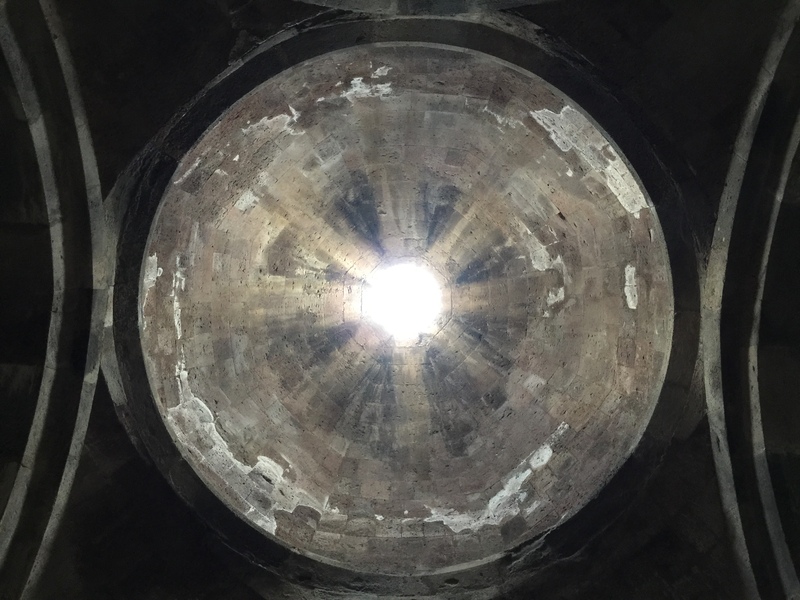 Soon after, nearly a quarter of the entire Russian copper was being mined in Alaverdi. At the end of the 19th century, the concession to exploit the mine was sold to a French firm. During the Soviet rule in the 20th century, the town acquired its current socialist industrial appearance. After the independence, the metallurgical plant was privatized to become a major employer for the town and its surroundings. 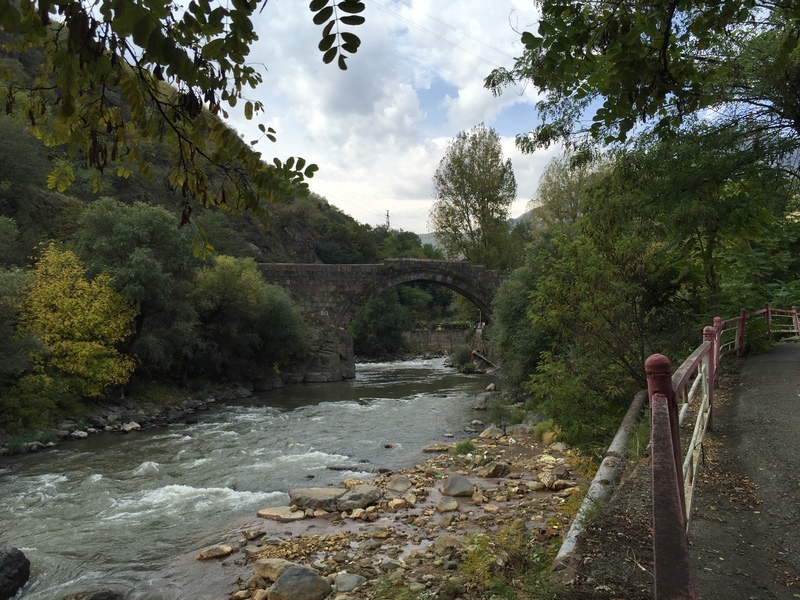 Alaverdi has many historical structures, including the 12th-century bridge of Sanahin. 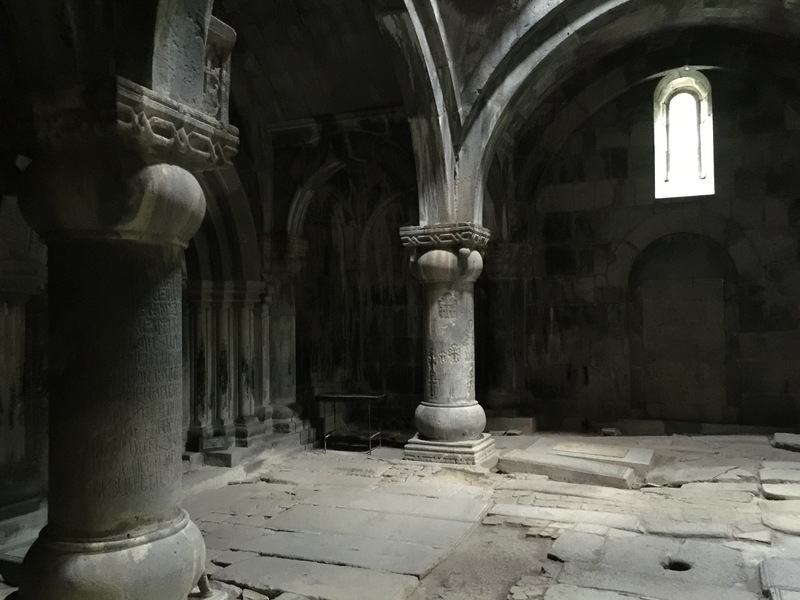 However, many other important cultural monuments are located in the vicinity of the town, including the monasteries of Sanahin, Haghpat, Kobayr, Akhtala, Khorakert, Khuchap, Ardvi and a basilica in Odzun. While moving to the English Club, on the bridge that crosses over the railway which goes to the copper mine factory: I suspect that it’s only being used by the factory, for there was no station for civilians. After our presentation, we decided to go for an hike to the top of the canyon. It was more about walking along the car road rather than a hike, still the view at the top was stunning. Panoramic photo from the top. 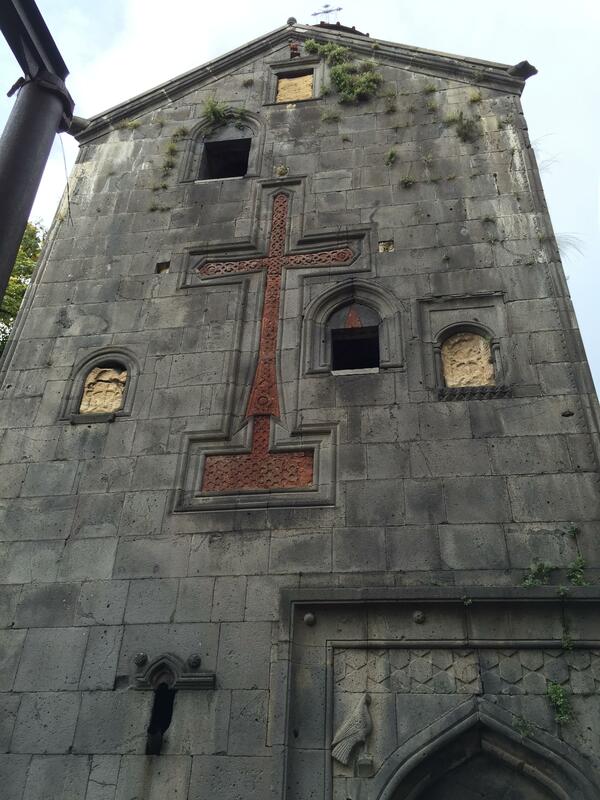 On the right side, behind and left of the cross, you can see the buildings. 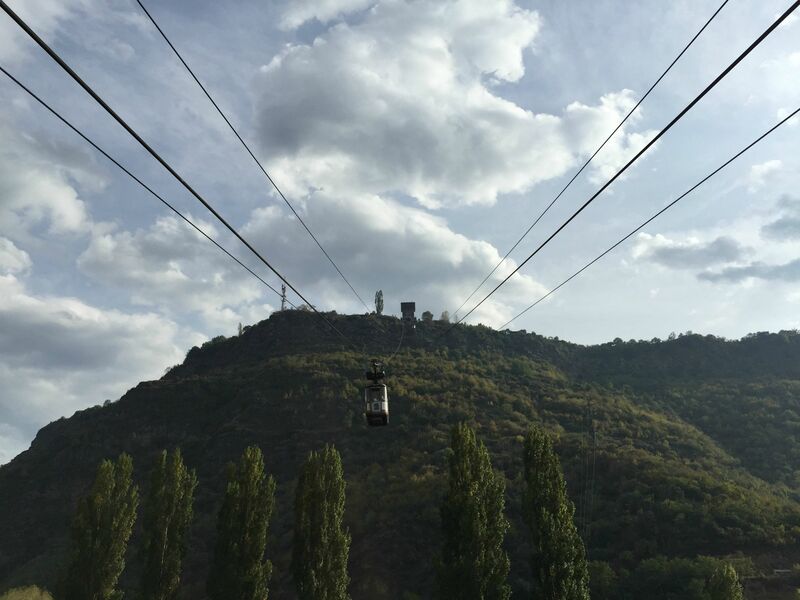 The cable car connects the high part of Alaverdi to the low, and it’s actively used as a public transport by locals. 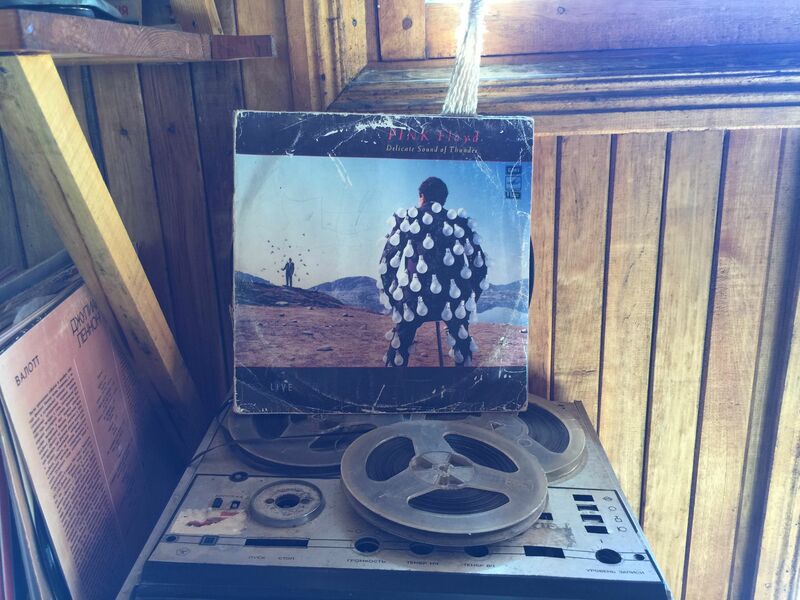 They have a great taste of music, with an amazing collection of old vinyls. 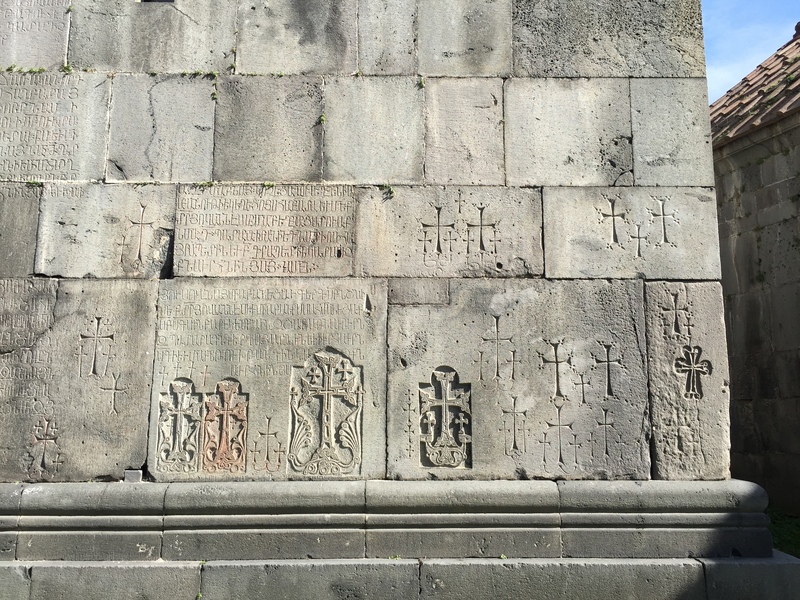 From the entrance of a primary state school in Armenia. 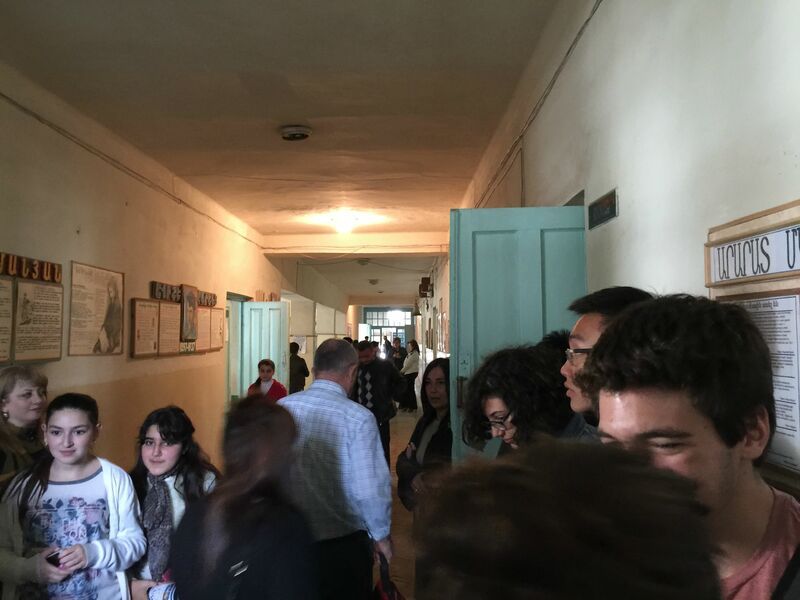 On our second day, we decided to visit schools in the region to see their living conditions, and to learn more about projects that are taking place in there. We presented our presentations that we created the night before, talking about our countries and our story to UWC. We also talked about what UWC is, how they can apply, and why should they try their chance. Ofa, who heard about UWC thanks to other UWC students who went to project week last year, encouraged them to apply and don’t worry about scholarships. We took care about what we were going to say, since it may misunderstood as showing off, especially considering their current conditions. 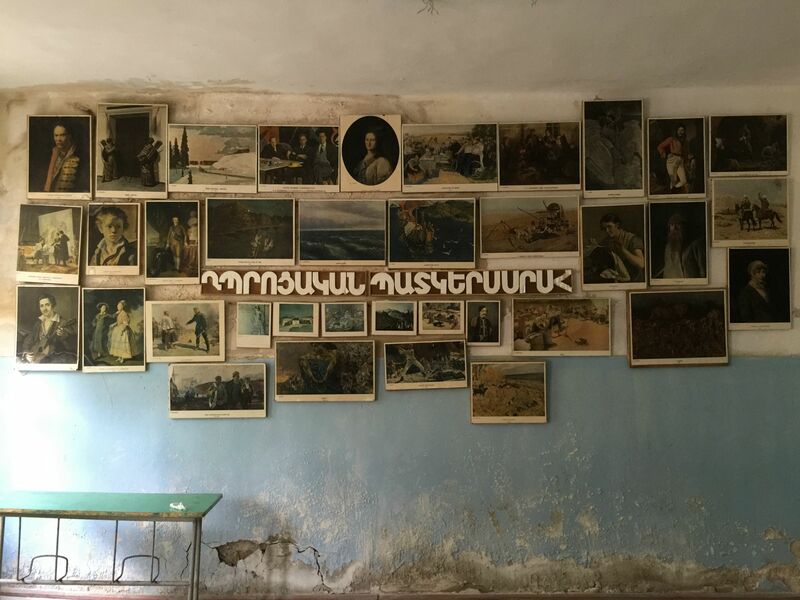 I don’t want generalize and apply what I saw there to the whole Armenia, but in case of Alaverdi, I can say that schools are suffering from bad conditions. E.g. some of them had many broken windows that even the inside of the building was really cold. The weather was manageable when were were there but I wonder what they are going to do in December and January. 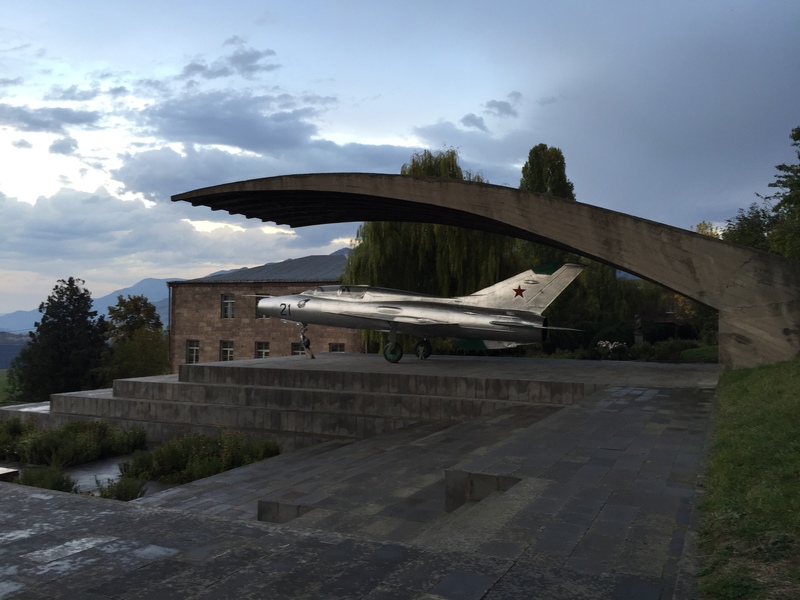 Also, as a general problem that I saw in both Alaverdi and Dilijan, there is a lack of good care. It’s understandable that all of these things are more or less depend on your budget and economic power, but this doesn’t change the outcome. 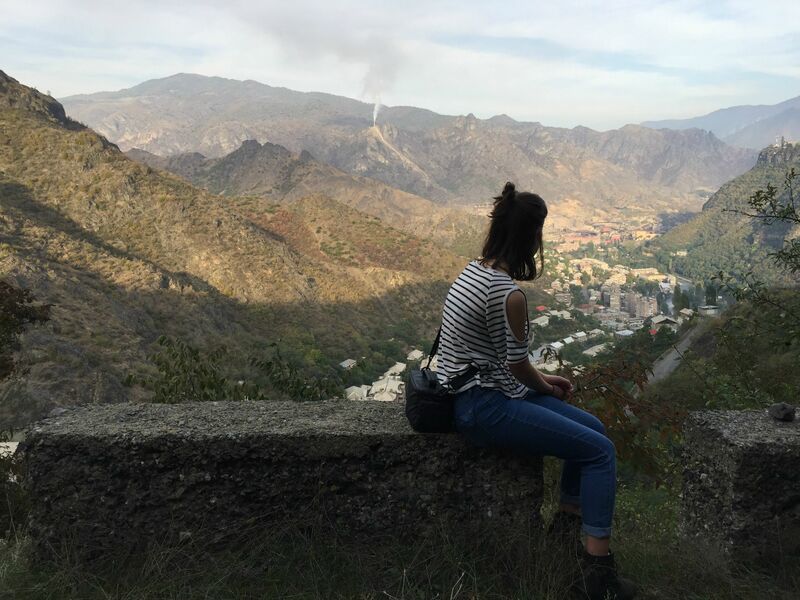 As a result of these issues, lots of students (mostly men) go to Russia to study and work (Side fact: 1/3 of Armenia’s GDP consists of money sent from Armenian workers in Russia). Maybe that is the reason why we saw many girls than boys in schools, in the English Club and in projects. From what I heard from a teacher, boys are more tend to get in the bad habits such as smoking and wasting their times, instead of studying. They also know that they can have job such as being a driver, worker, or something like that. Unlike boys, girls don’t have these opportunities and they know that only way to overcome their ill fortune is to study (and leave the country, maybe). 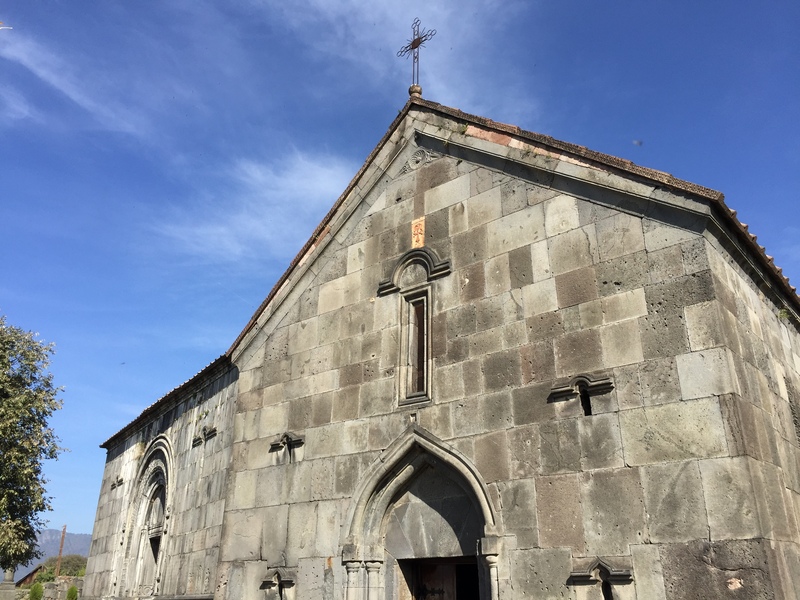 After finishing our visitations, we started walking to the cable car, to go to the high-Alaverdi and to visit a monastery there. 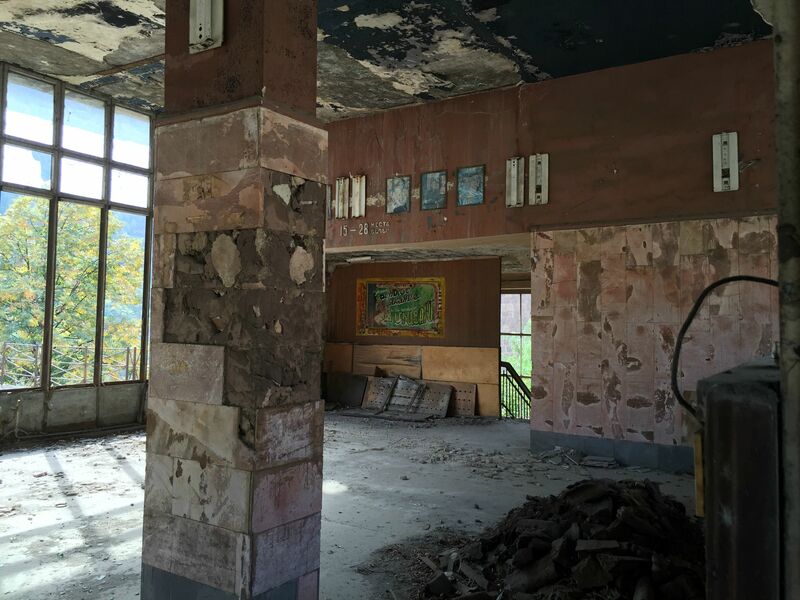 Hall of an abandoned cinema in Alaverdi. Inside of the cable car station, while waiting for the cable car. You can see the our supervisors talking: Dimitrina and her husband Anton. From the entrance of monastery. 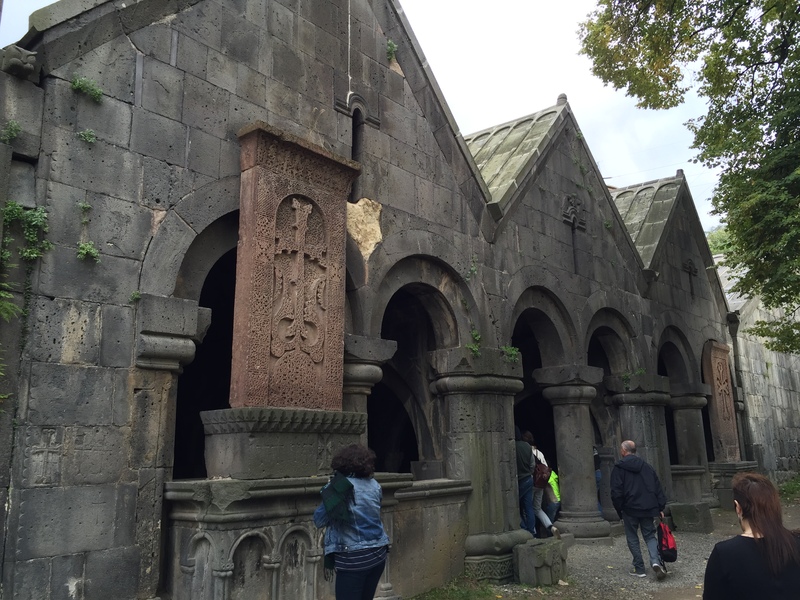 Pamela, standing in front of khackar, also known as Armenian cross-stone. 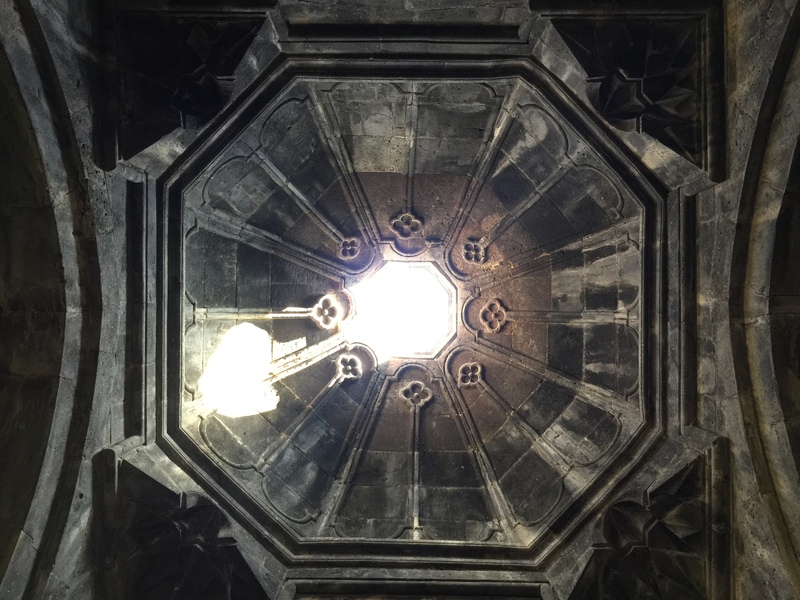 It’s a traditional culture of Armenia, which requires lots of craftsmanship. These are the graves of noble people, who considered important enough to get a space in the building. 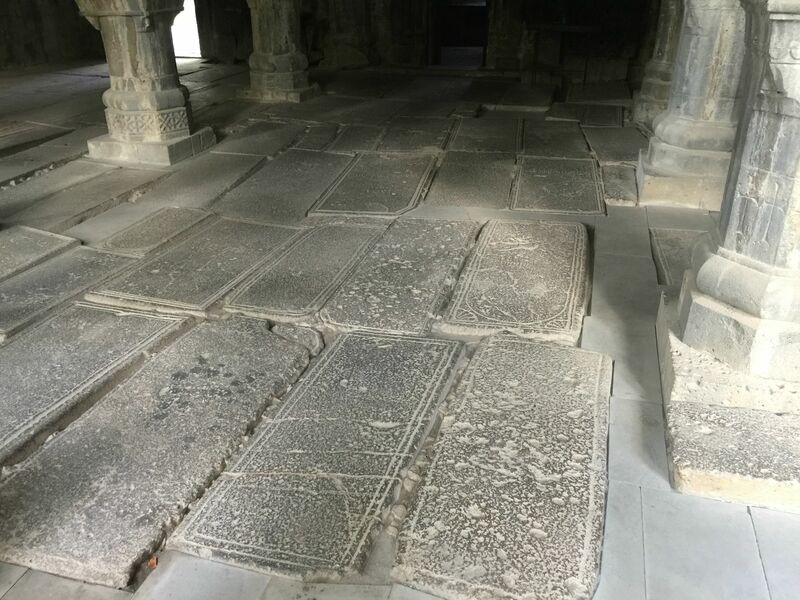 The idea was that, by burying them under the ground, they could serve the people in monastery by allowing them to walk on their gravestones. 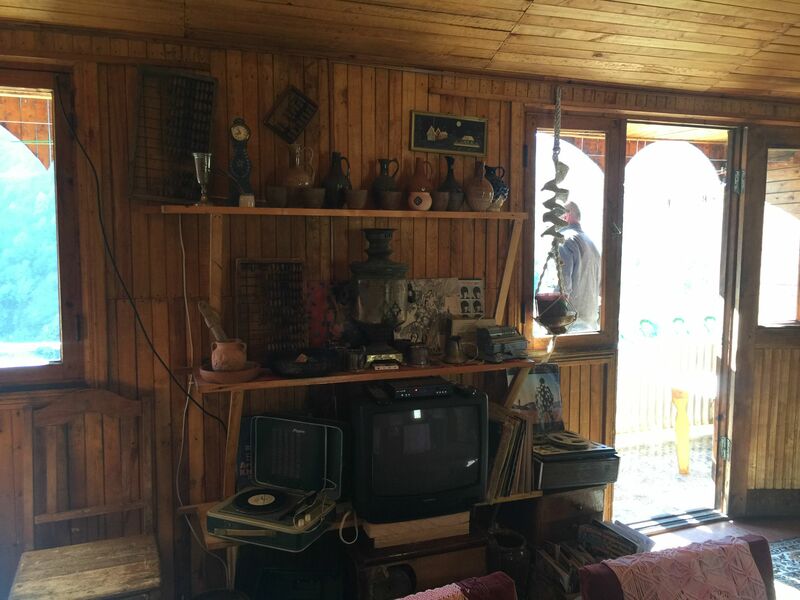 This is the area where lessons were given. The (maximum 14) students sit down between columns and listened their teachers. Most of the subjects where about religion and mathematics (if I remember correctly). Also, physical punishment and maintaining a pressure all the time, were common in those days. 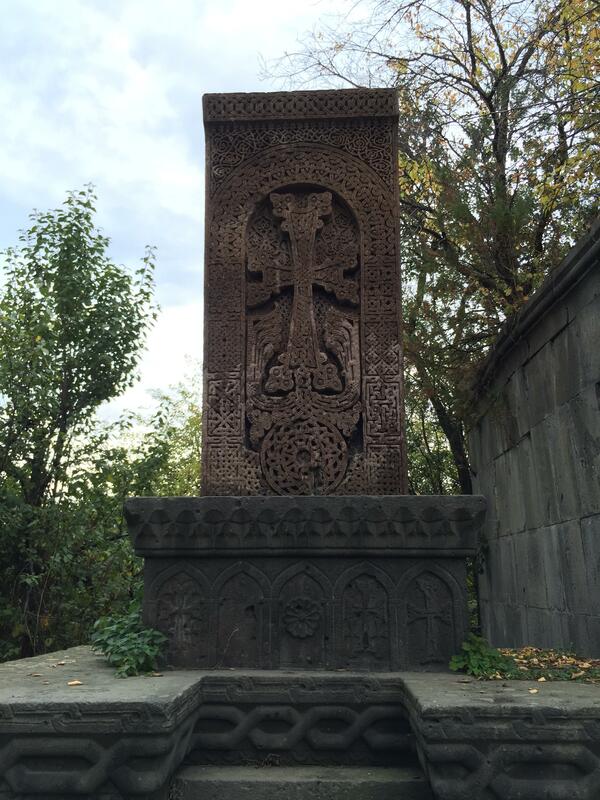 Closer look to another khachkar. When we arrived our B&B, we met with lots of people around the Europe, a men group from Netherlands, a young couple from Czech Republic, and an old couple from UK. 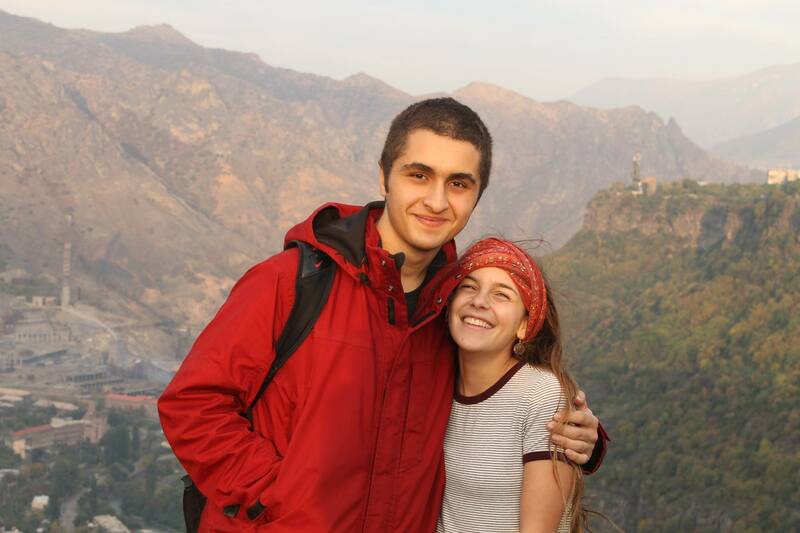 Some of them had seen our college in Dilijan, and they were quite shocked how big and expensive it was. Immediately, we took a defensive state and explained that we have scholarships, and we are not that rich. Sometimes, I can’t desist myself asking the same question. 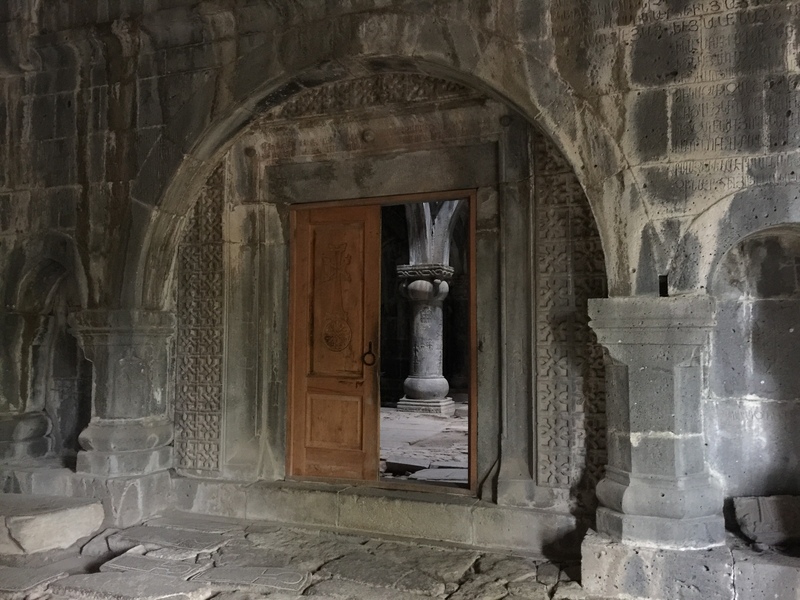 After seeing the conditions of schools in Alaverdi (and probably not so much different in other places of Armenia as well), our school seems like a great luxury. I’m grateful that I had a chance to have such great opportunities, but also thinking about what could have done with our school budget makes me uncomfortable. After the dinner, we requested a pot of their special tee, and went out to the yard of the hotel with our blankets and the snacks that we bought on the road. It was a clear sky, without air and light pollution, and we talked a long time under the stars. I’m always fascinated at looking to the stars, for it was nearly impossible to see them back at home, İstanbul. 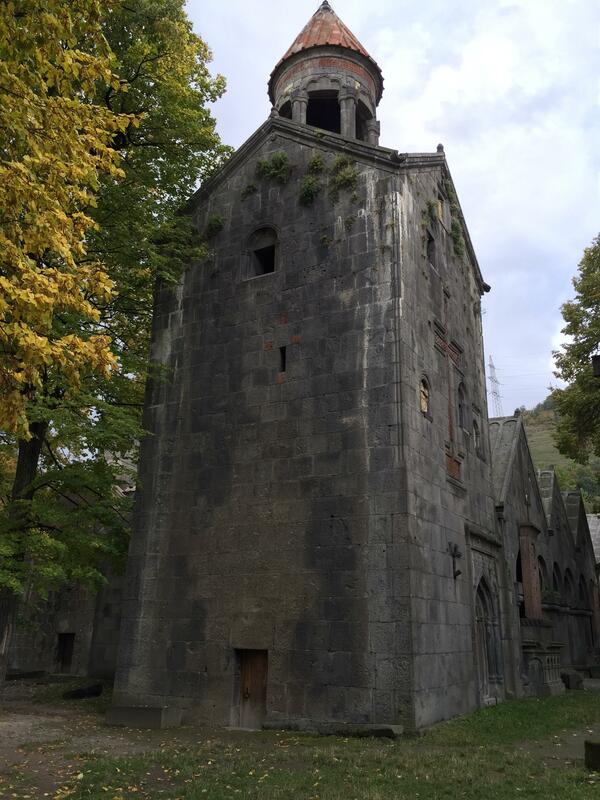 On our last day, we visited the old copper mine, which is still in active use. It was forbidden to shoot photographs or videos so I have nothing to put here. Also, we didn’t have chance to see every part of the mine, due to time restrictions and also probably it was prohibited. 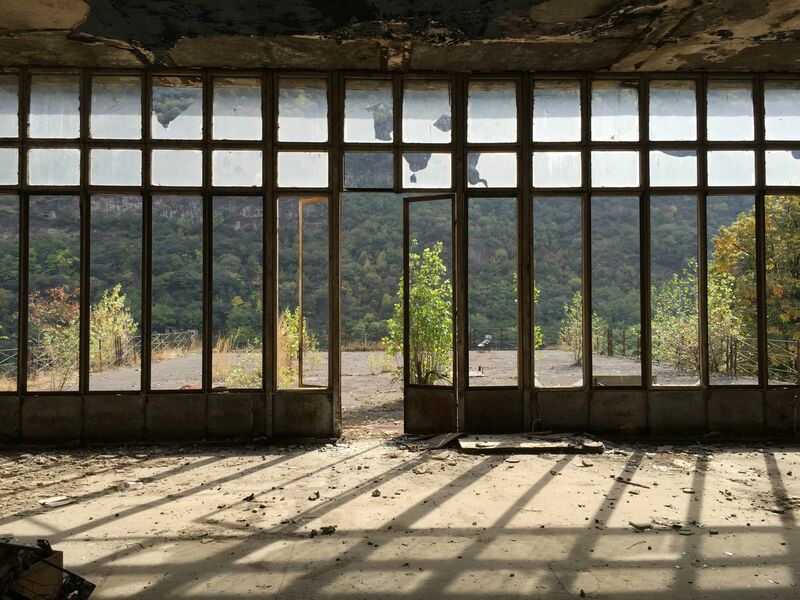 To talk about what I’ve seen there, it’s an old mine where workers and people of Alaverdi have no protection against it. 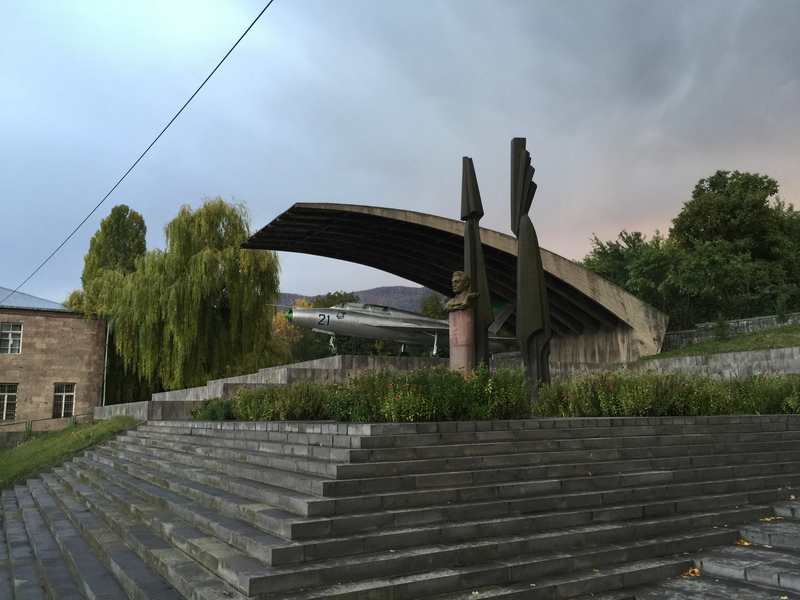 It contaminates air and the river, said the woman in Alaverdi Town Hall. She said they are measuring the pollution level regularly and working towards to make the mining company, Vallex Mining, to obey safety regulations. The problem, she said, it’s cheaper for them to pay the fines rather than take the measurements. It’s been a month since I started writing this post, and I feel that I shouldn’t postpone it anymore. There is still a lot to say, and I’m sure that lots of things are forgotten. Pardon my laziness and forgetfulness.